Nancy Drew, the classic mystery-solving heroine, returns in these special-issue omnibus editions. Each collection features three bestselling, classic Nancy Drew mysteries. 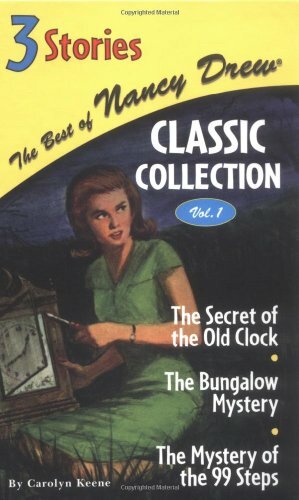 #1 The Secret of the Old Clock: Nancy Drew?s keen mind is tested when she searches for a missing will in this mystery that started them all. 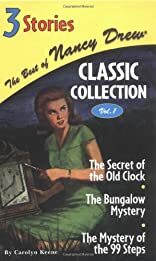 #3 The Bungalow Mystery: When one of Nancy?s closest friends suspects her guardians of trying to steal her inheritance, Nancy?s search for clues leads her to an old, abandoned bungalow. #43 The Mystery of the 99 Steps: Despite warnings from a stranger, Nancy sets out for France to search for a flight of 99 steps that may help solve the mystery of a weird dream and a possible case of blackmail.